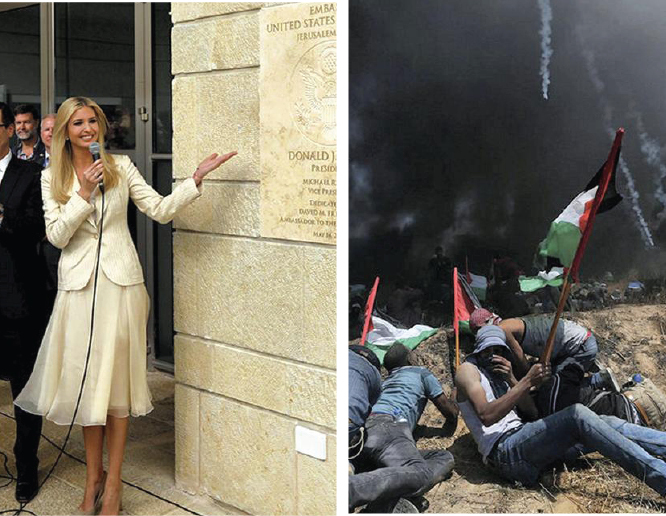 On May 14th, 2018, while Israelis, celebrated the relocation of US Embassy from Tel-Aviv to East Jerusalem, Palestinians protestors along the Gaza Israel border were counting their dead and injured by the thousands. The international community was outraged at the wholesale shooting of unarmed protestors by the Israeli Forces. By May 18th, The United Nations' top human rights body, United Nations Human Rights Council (UNHRC) had passed in a special resolution 29-2, to send a team of international war crimes investigators to probe the deadly shootings of Gaza protesters by Israeli forces. His Excellency, Mr. Zeid Ra'ad al-Hussein, the UN human rights chief, had backed calls for an international probe. Al Jazeera reported, “He heavily criticised Israel's response to the weeks-long mass protests in the Gaza Strip as "wholly disproportionate". Al Jazeera reported, “Speaking to the session via a video recording, Michael Lynk, UN special rapporteur on the situation of human rights in Palestine, said Israel's use of force may amount to"a war crime". Well at least for a brief period the collective conscience of international community seemed to have been shaken to its core. It was not long before everyone stared changing their tune. By May 18th, at the meeting of UNHRC on this special resolution, calling for an investigation, the approved resolution said. Investigators must "investigate all alleged violations and abuses ... in the context of the military assaults on large-scale civilian protests that began on 30 March 2018." Ms. Rosemary McCarney, Canadian Representative in Geneva before the UNHRC, strongly criticized a resolution passed 29 – 2 by the UN Human Rights Council calling for just such an investigation. Only Australia and the United States voted against it. The Canadian government seemed to have been back paddling, or flip-flopping on their initial call for an independent investigation, Gaza Inquiry, for the Israeli aggression. Ms. Freeland claims before the House of Commons is completely misleading, as she certainly does not have all her ducks lined up properly, for several reasons. First, 19 out of 29 members nations who supported the UNHCR Resolution against Israel, were not Muslim countries. Second, the UNHCR Special Resolution occurred on May 18th. Canada’s PMO had already called for an independent inquiry on May 16th. Clearly, Ms. Freeland is trying to confuse the House of Commons with her bogus baseless information disregarding the fact the international community was outraged at what our PMO described it as “inexcusable” use of “excessive force” by Israel. Ms. Freeland needs to get her facts together that it is not Pakistan or other Islamic countries pushing for and investigation. PM Trudeau was among the first one to call for such an investigation, and he was not alone among the world leaders to call for such an investigation. It is high time that PM Trudeau owns up to his demands for an independent investigation. An investigation under UNHCR and not get side-tracked by unnecessary noisemakers who would are focussing upon getting the worlds attention away from the human rights violations which took place on Gaza Israel border on May 14th, 2018. An independent investigation without the UNHCR mandate may not be of any use. The Canadians are puzzled, even though large numbers of Canadians, including Canadian Civil Liberties and other notable, non- profit, human rights advocacy organizations have written to the PM to stay the course and continue to push for an investigation. Yet, PM Trudeau on one hand seemed to be pushing for an investigation, but not through the United Nations. Why even have the UN? This makes many wonder if the PM Trudeau, is honestly and earnestly sincere about his objective, that is, finding the truth, and holding the perpetrators accountable and responsible for their actions, or is he just playing politics? Whatever the case might be, it will unfold itself eventually. For the time being we encourage everyone to remember the helpless victims and their families in your prayers during the month of Ramadan.